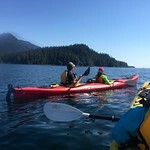 Hear about Cruising Southeastern Alaska on UnCruise Adventures as the Amateur Traveler goes on a cruise where dressing for dinner and bingo are replaced with kayaking and bushwhacking. Chris and his wife explored with 84 other passengers on the Safari Endeavor the islands, inlets, and glaciers of the Alaskan panhandle. This cruise started in Juneau, ended in Juneau and never stopped in any other cities or towns in between. Instead the Safari Endeavor spent two days in Glacier Bay National Park (the big boats can’t) and the rest of the week exploring bays and inlets on Chichagof Island, Baranof Island and the mainland. During the week the passengers kept a daily tail of wildlife sightings which included Alaskan brown (Grizzly) bears, black bears, moose tracks, sea lions, seals, sea otters, a river otter, humpback whales, orcas, Dall’s porpoises, bald eagles, puffins, seagulls, and many other native birds. Each day the passengers chose between kayak trips, hiking, bushwhacking in the trailless wilderness, stand-up paddle boarding and sightseeing by skiff. All of those activities were included but the smaller ship did not have a pool, climbing wall, theatre, spa, jewelry store, or casino. There was no bingo, napkin folding or dance performances. This is a different kind of cruise. A cruise where you sleep well because you were kayaking for hours, and not just because it has an open bar… although it does. Explore the Alaskan wilderness with Chris and UnCruise on this the 10th anniversary show of the Amateur Traveler. 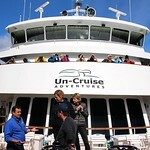 Watch the video of our adventure Visiting Alaska with UnCruise Adventures – Video #81. Photo – Can you spot the small ship? With thanks for 10 years! Hello, I recently found your podcast and I have been listening non stop. I worked in Glacier Bay, AK in the summer of 2015. I absolutely loved it and your podcast brought back so many good memories. Thank you for that and all of the other amazing episodes!